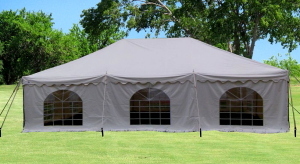 Party Tents and Festival Tents are a nice addition for any large outdoor event. Never let the weather spoil the big party. 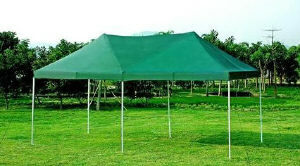 Because of the large expense of these huge canopies, renting is usually the best option. PartyPop.com has a State by State directory for rental agencies that deal with festival tents and other extra large canopies. Eureka sells a wide variety of party shade and they have a rental locator to help you find a rental location close to home. The accordion frame lets 2 people set this canopy up in less than three minutes. The durable steel frame will last for many years. The vertical walls give plenty of protection for tables and chairs. The high eaves allow for ample head room. This package includes extra stakes and lines for windy conditions. This is a 29' x 21' wedding tent. It can be used with or without the side panels. This white tent is 10' x 30'. Place a couple of these side by side and let the party begin.